In the 1980s, private medical care began to grow in China. Until now it has developed for 30 years. During this period many private hospitals that are high-class, reliant and highly praised by ordinary people have sprung up. Founded in August 2005, Modern Cancer Hospital Guangzhou is one of them. Currently, the government is encouraging putting social capital into the field of healthcare, so private hospitals and public hospitals running neck and neck will be the trend. Some private hospitals with better superior medical resources even build their own brands. Through eight years of development, Modern Hospital Guangzhou which is located at the foot of Baiyun Mountain in Guangzhou has gained good public reputation and achieved rapid development, extraordinary accomplishments & sustainable development of the hospital with its continuous expanding, advanced equipments, leading technologies and impeccable system. For many years, Modern Hospital has stick to the corporate mission of “providing the most convenient and intimate high quality medical service for human health”. With hard working and a pragmatic attitude this hospital which provides international medical services for domestic and overseas patients has accumulated powerful energy in the wave of medical reform. Ninety-percent of its inpatients are from Southeast Asian countries and it is also the first choice of residents who live nearby. Nowadays the division of departments in big hospitals is becoming more and more fine, which has the advantage of specialized departments becoming more professional. However, many patients usually suffer from several diseases or some complications, which makes diagnosis and treatment more difficult and makes it impossible for a single doctor or a single department to solve the problem. “Our medical serving principle is go beyond the division that is too fine, communicate with other departments and apply combined therapy to patients by building a platform where multidisciplines intersect. This mode of combined therapy can help doctors share experience and knowledge through communication and medical behaviors cross the limit of personal experience and knowledge, so all doctors’ ability and efficiency of diagnosis and treatment are improved. For example, in the treatment of cancer, internal medicine, surgical department, TCM department, interventional department treat a patient at the same time or successively. This treatment mode makes use of the advantages of both surgeries and interventional therapies and can decrease the occurrence of complications and traumas, thus achieving the optimal therapeutic effects.”said Wang Huaizhong. As far as private medical field is concerned, “credibility crisis” has always been a weakness through the development of private hospitals. Since its foundation, Modern Hospital has born in mind the mission to provide excellent and sincere medical service and care for the humankind. It regards running a hospital as an evergreen cause. Humanized services are provided, such as“five-star service”, “medical guide company service throughout patients’stay”, “one patient in a room”, “interpretation of eight languages”, “organize overseas patients to go shopping and take a trip in walking streets at regular intervals”. All these services make it more convenient for patients to receive treatment in our hospital and put their mind at rest. “Currently the competition in healthcare industry is increasingly fierce. Running a hospital definitely needs profit, but our first concern and goal is to cure diseases and save patients. Modern Hospital adopts the philosophy of building company brand and long-term development. Economic benefits are obtained only when we attach most importance to social benefits.”said Wang Huaizhong. For eight years, Modern Hospital has updated its service, standardized its management and enhanced inner construction. The hospital has lowered the prices of tests several times and developed clinical approaches for certain diseases with the charges paid in a lump sum. Health lectures and home visit physical exams are carried out in communities. Transparent charging and quality services have helped the hospital gain good reputation. 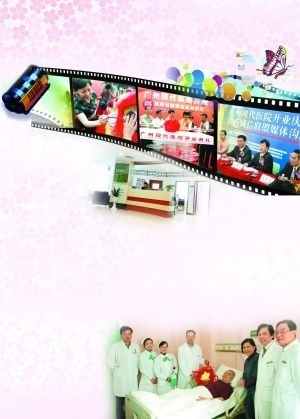 In 2013, Modern Hospital Guangzhou becomes one of 30 sustainable private hospitals in Guangdong Province. The primary objective of Modern Hospital is to develop advantage technologies and advantage specialties, foster technology innovation, improve quality of medical care and build public awareness timely. By achieving these goals, we can build our core competitiveness. Through eight years of development, Modern Hospital has become a technology program that has some advantage in Guangzhou. It is a comprehensive international hospital of a considerable size that integrates medical care, teaching and prevention & healthcare. It is the demonstration base of minimally invasive gynecology in South China. Modern Hospital keeps improving technologies, offers patient-oriented service and pays great attention to patients’experience. Building a harmonious doctor-patient relationship has always been Modern Hospital’s goal. For eight years, Modern Hospital has adopted the service mode of going out of hospital departments and going into communities in order to ease the situation where seeing a doctor is very difficult and expensive for the masses. The hospital has offered “60 value-added”services which have been highly praised by both domestic and overseas patients. The hospital also attaches great importance to medical care in communities. It has given voluntary treatments of basic diseases and health lectures for a total of 1920 times. It has set up health records for community members and has opened up a green channel for appointments to meet their medical care needs. For eight years, through enhancing inner construction and providing various public services to serve and repay the society, Modern Hospital has met the goal of both gaining profit and giving beneficence and has taken the responsibility as an enterprise citizen. For Modern Hospital, the 8th anniversary is a beginning point that is a milestone. It will make efforts to achieve the objective of becoming a best international brand hospital and move forward stably as private hospitals welcome an unprecedented development opportunity and market prospect.